A Memorial Wall has been purchased for the CHAI Learning Center of West Houston. Our sages tell us that the best memorial for a Jewish loved one is to donate Tzedaka (Charity) in their memory. You can dedicate a plaque on the Memorial Board. Each plaque will be engraved with the name of the deceased, (Hebrew & English), and date of passing on the Jewish and secular calendar. 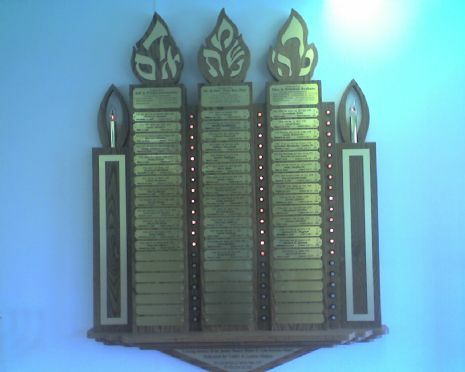 There will be a light next to each plaque, that will be lit during the month of the Yartzeit, on the High Holidays and for all occasions when Yizkor is recited. The memorial donation for each plaque is $360. This is an introductory special for the first 20 plaques. The price will then be $500 a plaque. Top 3 bigger plaques are $1,000 each. You can donate the entire board in memory of a loved one and recieve a big plaque at the bottom of the board for $3000. Payment can be made by check or credit card. To make a credit card payment through our website click here.